Since I last published an entry here I’ve been through some serious life changes. I started a new job. I got married, and didn't make anyone wear pink taffeta in the process (shout out Super Special #12, Here Come The Bridesmaids). I - like, within the last month - got a mortgage. I mean, I get it, this blog isn’t about me. But life moves on, man! (Unless you’re a Stoneybrook-based babysitter caught in a time loop of eternal eighth grade-ing.) My point is, life is what happens when you're busy making other plans to babysit the Rodowsky boys on Friday, am I right? When serious blogs (that is, blogs that update semi-regularly, take care of their domain names, etc. . . . blogs that are not this blog is what I am saying here) finish, they typically do so with a final entry. 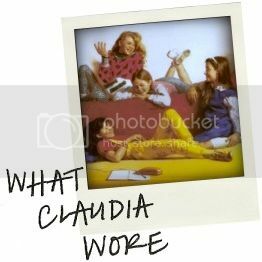 I never wrote one for What Claudia Wore, and though this sounds like one, it’s not. Someday I’d love to point to this blog and have it be an archive of every outfit* in the Babysitters Club series. That was the goal that I had in my mind when I started the Book Index, and it’s still a goal, even if not one I’m actively pursuing right now. What Claudia Wore isn’t over. It may be on an indefinite hiatus, but I still can’t pass an Urban Outfitters without a small lol at today’s Kishi-relevant fashion trends. And even if I never write another entry, knowing that it’s here, at the original URL it launched from in 2007 . . . that’s important to me. Even if it’s kinda cheating. Just call me Shawna Riverson. So what happens after graduation? Well, you move on to the next adventure. For me, that means a new medium. I have done a lot of writing on the internet. All the way back to 1997, when 'writing on the internet' was, um, mostly about whether Mulder and Scully were ever going to get together for real. I've been on the internet for more than half my life at this point, and it's a huge part of who I am. I'm an internet person. So let's talk internet. Podcast-style. In our first recording sessions, we've explored the cult of Konmari (including the crazy amount of privilege inherent in being able to discard anything that doesn't spark joy), our internet histories and that early 2000s livejournal lifestyle, and we're even dedicating an episode to this little blog right here. We'll be launching next month and I hope you'll consider joining us -- you can sign up for our tinyletter to be notified when we're live. Finally, I want to say thank you. I wasn't great at showing how much I appreciated every reader, every comment, every telephone cord bracelet-induced sigh of nostalgia. I loved them all and I've loved sharing this experience with you. You say goodbye, I say hello (to your friends). * at least, of every Claudia outfit . . . I don't know how many more of Jessi's leotards I have in me. ** it can be a thing.